Send this Winsome Ensemble of Blooms and Sweetmeats to your revered one and imbue the meant-for heart with pleasing thoughts of yours. 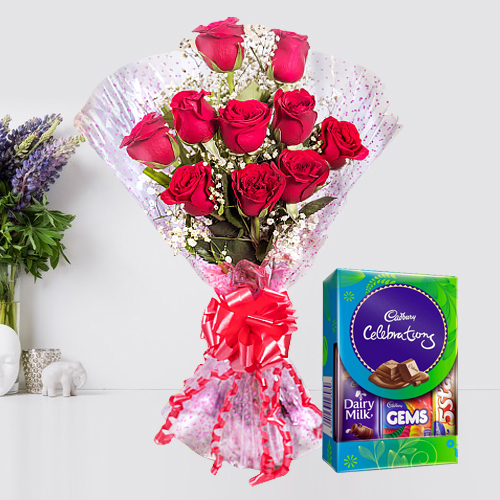 This Ensemble shows a Cadbury Celebration Mini Pack and Ten bonny Red Roses embraced by a flush Tissue Paper. Flowers Delivery Guntur, Send sweets Tirupati, Wedding Cake Baroda, Diwali Mithai Tiruchirapalli, Send Flowers and Gifts to Bilaspur, Online Shop Jalandhar, Flower to Agartala, New Year Flowers Firozpur , Fresh Fruits Sirohi, Send Gift Amritsar, Dry Fruits to Baroda, Birthday Delivery Gandhidham, Sending to Surat, Flower shop Tiruchirapalli, Secundrabad Online Cake Delivery.